Mark and I are pleased to announce that Williams & Heintz Map Corporation has been featured in Printing & Graphics Association MidAtlantic (PGAMA), Sustainability Spotlight. PGAMA is the leading trade association serving the visual communications industry in Virginia, Maryland, Washington, D.C. and Southern Pennsylvania. PGAMA represents over 1200 firms across the region. The spotlights focus on projects implemented by a member company reducing the environmental impact of their processes, or supporting the sustainability of their company. The spotlights are structured in the form of case studies so that the membership at large could adopt a similar project at their company. PGAMA’s Sustainability Spotlight focuses on members’ environmental efforts. In the spotlight this issue is member firm Williams & Heintz. Located in Capitol Heights, MD, the company was established in 1921, and creates custom maps, provides map printing and folding services, offers GIs cartography, and more. President and chief stockholder Holly Heintz Budd is an environmental ecologist with a B.S. in environmental studies from Rutgers University and an MBA from trinity D.C. University. As a result of her leadership in this area, the firm has employed materials and practices that are as kind to the environment as possible. 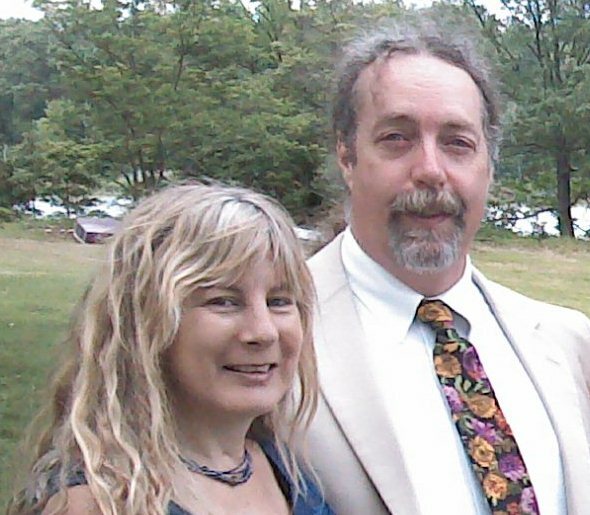 Holly says, “Williams & Heintz Map Corporation is a sustainable printer whose ‘green’ initiatives are not just a marketing tool. At Williams & Heintz, we strive to minimize the impact of the environmentally and energy intensive process that is printing; as well as to maintain a good, healthy workplace.” Following is the William & Heintz sustainability story. Mark Budd, the company’s secretary/treasurer, says Williams & Heintz (W&H) has always implemented environmental activities, and got started for the same reason many businesses do: to reduce expenses. It began with simple measures, such as recycling aluminum plates and paper. Now, however, W&H incorporates many more sustainable practices as part of their business operations, and sees it as one of the company’s core values. W&H made it a goal to stay on par with the environmental standards for California (the state with the strictest requirements in the nation), in order to do business with customers there. By doing so, the business has always kept one (or two, or three!) steps ahead of local requirements. W&H became one of the first printing firms to completely eliminate alcohol in both pressroom and finishing operations in the 1990’s. The dampening systems on their presses are alcohol free. Alcohol-based fountain solution was eliminated and replaced by substitutes. In addition, their press washes are non-petroleum and water miscible. W&H has noticed a positive impact from their sustainable practices across the board, from boosting the company’s bottom line, improving staff involvement and morale, and aiding with recruiting; to establishing loyalty among customers and receiving a welcome from within the community. Holly says that customers have always appreciated their sustainable efforts, and has found that it continues to give W&H a competitive edge. Mark adds that today’s customers are more educated about environmental practices, and not only appreciate them, but expect them. As far as impact on the staff, Holly says W&H sustainable practices are a source of pride for employees. Mark notes that as the company implemented new practices, employees HAD to get involved. But once committed, they contributed innovative ideas and energy to various programs. He also noticed that employee morale improved as they became more engaged and attributes that to the fact that, “…doing things better makes everybody feel better.” those efforts further instilled company pride and loyalty. The average W&H employee has been with the firm for 20 years. When it comes to benefits for the community, Holly says that W&H is a welcomed member since they are not adding things to local landfills. What’s more, since their sustainable efforts have helped to increase profits, the company has been able keep hiring workers…and retaining them. That is an obvious perk in any area. The company is currently working on G7 certification, and an effective color management plan to reduce waste of ink, paper, and time. Mark Budd says that the game plan for W&H certifications is to create sustainable green print. They have followed a series of steppingstones as they continue to work towards that goal. Holly says the first certification was ISO 9001:2008, a quality certification. They saw immediate benefits, but as they got into the practice of documenting how they did things, it brought to light other areas that needed to be changed. That led to the ISO 14001:2004 certification, an environmental management system, and subsequent certifications. Mark says the upfront costs of certification are initially just labor, and audit fees are not that extreme. But, the investment for W&H was well worth it since they began printing on plastic. He notes that the process they had been using previously, for printing on paper, simply needed to be changed in order for the company to maintain the same level of quality for which they are known. Holly says environmental stewardship “…is a passion” for her, and feels that PGAMA has given her a forum to bring her passion to her work. “Being part of PGAMA has been a wonderful resource for W&H environmental efforts because it gives industry executives the chance to share with and learn from each other about what sustainable practices they are each undertaking. She points to the Association’s partnership with EnerNOC as an example. “PGAMA’s collaboration with EnerNOC has been so beneficial for W&H, and we learned about it as a direct result of our membership. The program monitors energy usage, and has been an awesome tool to help us save money as well as energy! Read more our ISO certified printing here. Read more about Williams & Heintz’ Environmental Practices here. Read my Environmental Policy Letter, (pdf) here. Williams & Heintz Map attended the Printing and Graphics Association MidAtlantic (PGAMA) 2012 Excellence in Print Awards Gala on March 23rd. Our maps were finalists in the map category, winning Awards of Excellence. 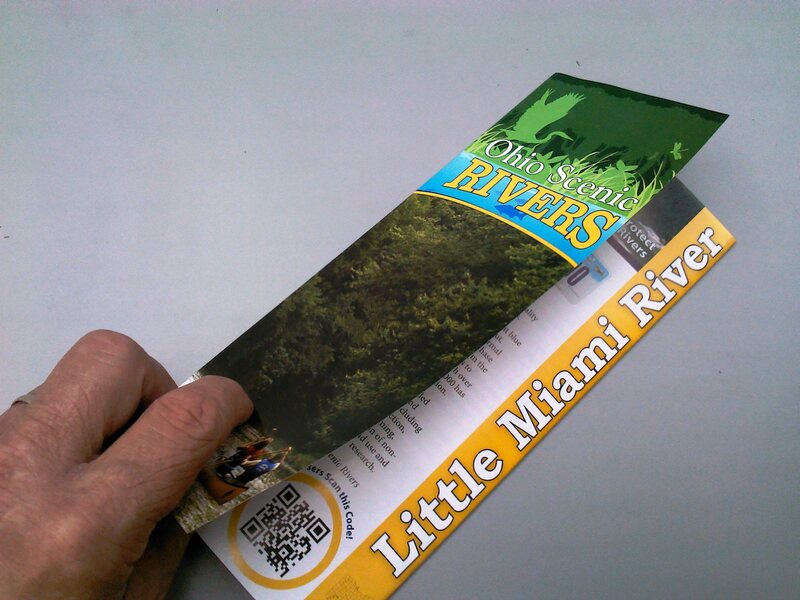 Our printing and folding of the Ohio Scenic Rivers Map, for the Ohio DNR, won the Best of Category Award of Excellence for Folders and Brochures, Process! 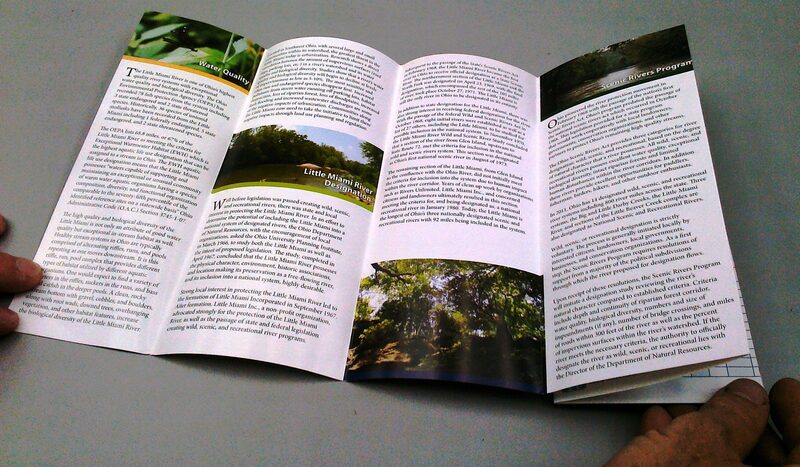 The print quality of everything entered was excellent, so it must have been the tricky map folding that won the award. The 55 inch x 8 ½ inch piece is 15 panels that first accordion fold. 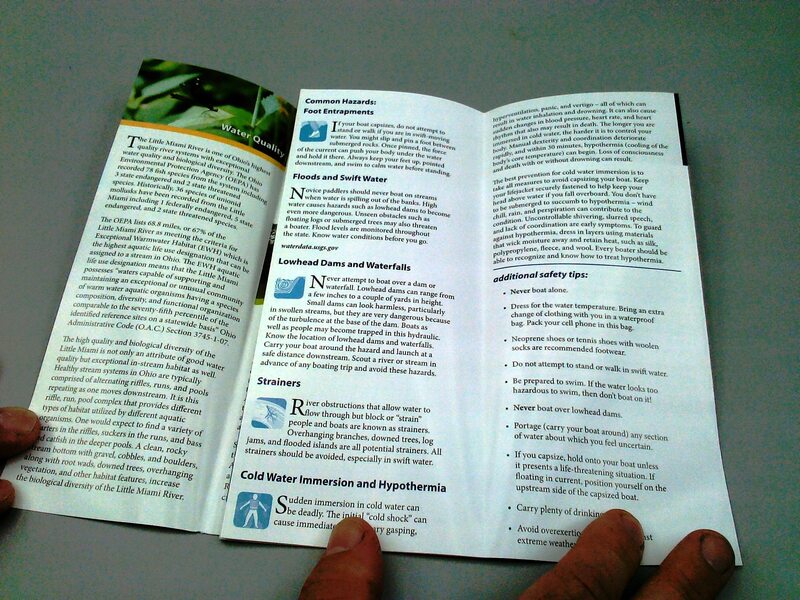 Then, the last two folds wrap around, resulting in a short fold on the cover. We had to feed it tail first. The final size is 8 ½ inches x 3 ¾ inches. Here is a link to my previous post with map folding and finishing tips. This map was featured in a post about QR Codes. 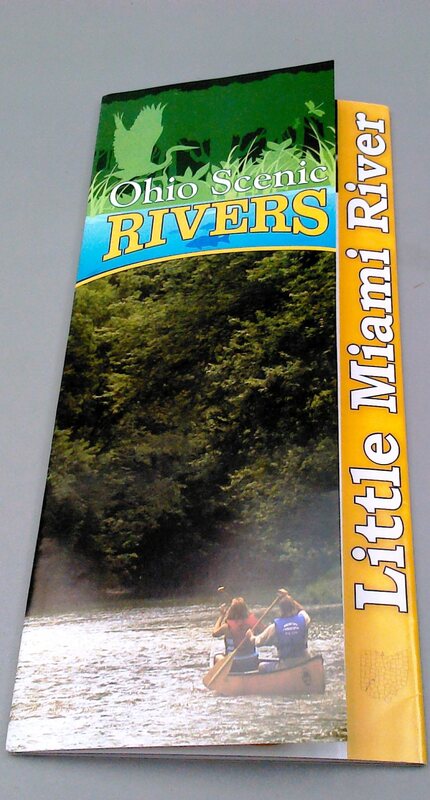 The Little Miami River is designated as an Ohio State and National Scenic River. It has breathtaking vistas and scenery and a rich history. 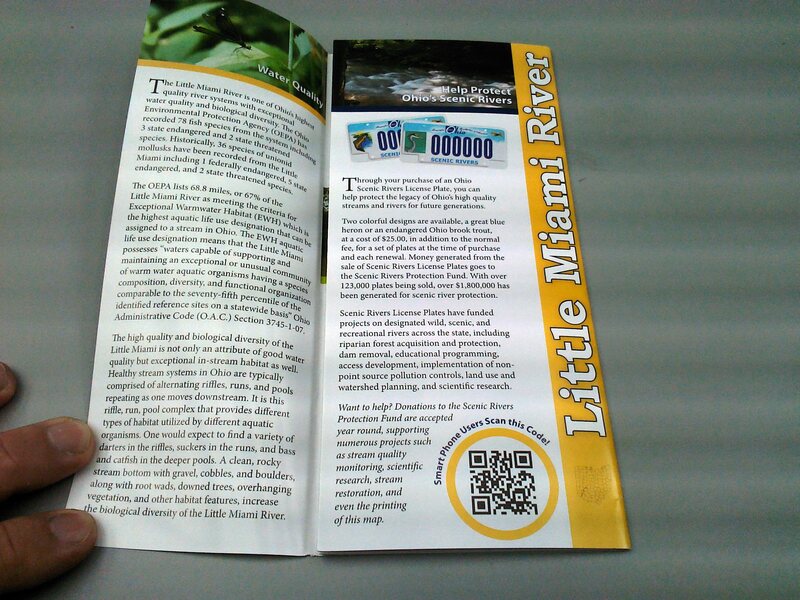 The Little Miami River and its watershed support an abundant variety of plants and animals.